Home Politics I Would Rather Be Impeached, Than Loot 45 Billion Naira For Your Election -Akinwunmi Ambode Dares House of Assembly. I Would Rather Be Impeached, Than Loot 45 Billion Naira For Your Election -Akinwunmi Ambode Dares House of Assembly. 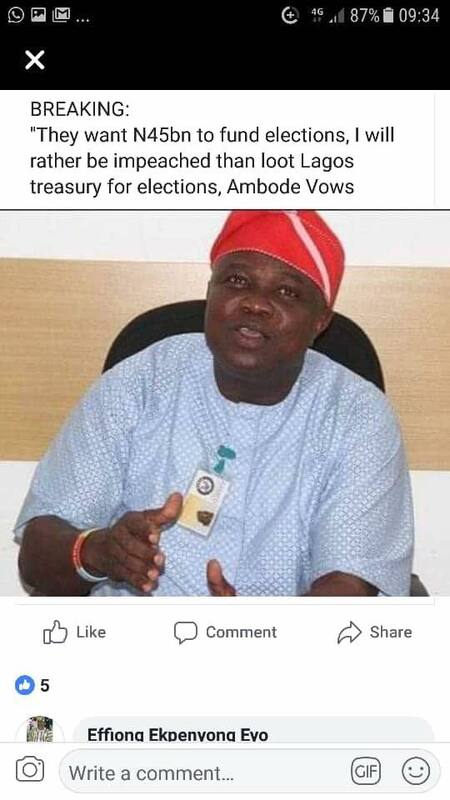 This Newspaper caption caught my attention this morning and i sincerely do wish the Governor of Lagos State, Mr. Akinwunmi Ambode didn't make this statement credited to him, but if he did, then there is more than we all know concerning the impeachment proceedings against him by the Lagos State House of Assembly. 45 Billion Naira for election of House of Assembly Members? That's far too huge an amount of money and the allegation, very profound and i hope the House of Assembly responds to this as quickly as they can to save their faces.